At the end of May, my 10-year-old marked a full two years of taking piano lessons. In less than two years, he advanced to playing late intermediate/early advanced repertoire. This is quite remarkable, and for me, it finally sunk in just how remarkable this is over the past year. Of course, my husband recognized it right away, and I give him full credit for his swift and fierce support! My son has some natural talent, and I think it’s safe to say that becoming a classical pianist has become a serious goal for him. But I can’t underscore enough how hard he works at this goal. It’s been inspiring to watch, and my husband and I are so proud of him. Not only does he practice a lot, he loves listening to classical music and learning about composers. His knowledge about music, music history, and modern pianists is remarkable in itself. And we don’t have to make him do any of this or fuss at him to practice. Not at all! My husband is always right there with him, encouraging him and sometimes advising him (he’s not a musician; he just loves doing research), but if my son didn’t want to do this, none of this would be happening. I’m calling this post our “piano adventures” because it’s been an adventure for all of us. My husband and I have learned so much about classical music right along with our son, and we love it! Just like with all my sons’ interests, I have loved getting a real education and exploring and discovering things that I didn’t know about before. Not only do I love listening to classical music now, I love learning about the world of classical music and how pianists learn and grow. On this adventure we’ve also met various teachers and learned how they work too. This year we found a new teacher for our 10-year-old, and our younger son began lessons in October with another teacher. The 7-year-old is not as passionate about playing the piano as his older brother, but so far, he likes it. He is certainly benefitting from having such a talented older brother and everything we’ve learned about on this journey. During this past year, our 10-year-old entered his first competition, which was the state competition. 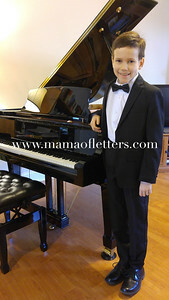 He placed in the top ten, which for two years of piano lessons, is wonderful (in my biased opinion). But my son has a long and challenging journey ahead of him. There are many talented, young pianists out there, and he’ll have to work very hard, if he wants to compete. If he continues to want to pursue this goal, we’ll give him all the support that we can. If not, that’s okay too. I have no idea what to expect, but I hope it continues to be a positive experience for him. If you have a child who wants to pursue classical music, please e-mail me! It would be great to meet other families who are on a similar journey.